WATCH VIDEO BELOW! Wow, what a way to celebrate Earth Day and launch our new shark awareness campaign! 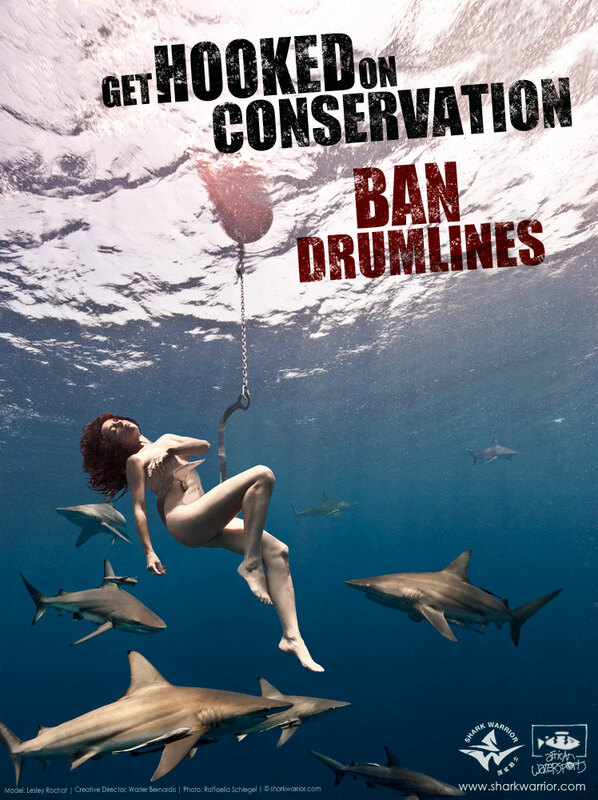 I’ve done some pretty extreme things for shark conservation but our latest campaign, in partnership with Walter Bernardis of African Watersports who was the creative director of the campaign, the GET HOOKED ON CONSERVATION, BAN DRUMLINES, campaign I guess is our most extreme. Not that I haven’t already stripped naked for sharks in our previous campaign, the anit-shark net CATCHES ANYTHING, KILLS EVERYTHING campaign, but this shoot was way more challenging. And not for the last word I say in our Behind the scenes video, ‘just’, which let me make clear upfront, knowing there will be some nitpicker claiming otherwise, that was said tongue in cheek. It was challenging because of the open ocean conditions, plus being naked, having to pose kinda dead hanging from a large hook while holding my breath and hoping the 30 plus sharks were in place! But we felt that extreme times require extreme measures: In light of the international outcry by conservationist and scientists against the culling of sharks in Western Australia using drumlines, we decided to turn the spotlight back home. Shark culling is not new in South Africa, the KwaZulu Natal Sharks Board have been using shark nets and drumlines for decades – up to 600 sharks plus hundreds of other marine life, including dolphins and whales are caught by these barbaric killing devices every year. People from all over the world come to see our sharks and the loss of large sharks such as the tiger shark is having sever negative impacts on the shark eco-tourism business in KwaZulu Natal. This senseless slaughter of our marine life is perpetuated by public fear, a public who know no better. Through the campaign we are raising public awareness and lobbying against the use of drumlines and shark nets in South Africa, and in Australia. South Africa turned to culling sharks when between 1943 and 1951 there were 7 fatal shark bites. Tourism revenue was threatened and the KZN Sharks Board was “charged with the duty of approving, controlling and initiating measures for safeguarding bathers against shark attacks”. Their answer to safe bathing came from Australia where shark culling had already been in place since 1937. Earlier this year and following the death of seven people within a period of three years, the WA government led by Premier Collin Barnett, coined Cullin Barnett by conservationists, introduced shark-kill zones off parts of the WA coast. Baited drum lines targeting tiger, bull or great white sharks bigger than three metres, have been deployed off Perth metropolitan beaches since January, followed by a similar roll-out in parts of the South West. Sharks longer than three metres caught are shot dead, while smaller sharks are released, though many released sharks are severely wounded and also die. This recent culling strategy hales from more than half-a-century ago when environmental awareness was lacking. It is not based on scientific evidence nor in the promotion of education and awareness, prerequisites of the 21st Century if we have any hope of saving our planet. Political agendas, power, greed and ignorance drive this decision. The WA trial shark cull program comes to an end on the 30 April 2014 but we are concerned that the WA government has made a submission to the Federal Environment Minister Greg Hunt to continue the program. It proposes to continue the shark-kill zones using 72 baited drumlines between November and April each year, from November 2014 to April 2017. So back in South Africa, apart from the fact that we participated in a shark rally against the culling in March, we believe that if we have any hope of saving sharks we need to reach the masses who have the power to help us win the battle. The challenge, however, is that they mostly fear and loathe sharks, but by using the very mediums, imagery and videos, and the channels that dominate society, social media, and via our powerful imagery we are promoting a connection between humans and sharks, especially through my own relationship with them. In so doing we hope it encourages people to see beyond their fear of sharks to seeing the beauty and fragility of sharks, and thus inspire them to help us save them. Studying the KZN Sharks Board 2012 annual report I was astounded to see that these long-entrenched culling devices cost millions of Rands of taxpayers money to maintain. In that year they received R41,3 million from a government grant and a further R19,6 million from local municipalities. Most of the money received by KZN Sharks Board goes into their shark fishing component of their business, while comparatively little goes to education, awareness and scientific research. More than 10 years ago they were researching alternative beach safety devices to the shark nets and drumlines, but gave me insufficient funding as their reason for it having gone nowhere slowly. They are still testing devices with many more years of research before they get any conclusive answers needed to satisfy the removal of the nets and drumlines. Comparatively AfriOceans, one of the most established marine focused conservation organization in the country, which I founded in 2003, work tirelessly to save sharks and other marine life with a budget of less than half of the KZN Sharks Board’s fuel and oil budget of R2 million rand for the year, used no doubt by their boats that set and maintain the nets and lines. Our government’s priorities are horribly flawed, they provide exorbitant amounts of money for the killing of marine life, supposedly in order to save a few human lives, but do not grant us any funding for the work we do in saving the environment upon which all of its citizens lives depend upon. In addition, the KZN Sharks Board call their public dissecting off the sharks they have drowned in their nets and on their hooks, education. We find this appalling considering that public dissections of the many dolphins they drown every year would result in an outcry, but they feel fit to dissect sharks, animals just as sacred, which also suffered the slow, cruel death that drumlines and shark nets cause. This money making public performance thus perpetuates the belief that the life of a shark is worth less than that of other marine life. What kind of education is that? But when their very existence is founded on fear of sharks, replacing fear of sharks with awe and wonder and the need to conserve them would be like shooting themselves in the foot, putting themselves out of business. The ocean is the domain of the sharks and we are merely guests in their world. We have no right just because a few of us get killed by sharks annually to go out and start suffocating and shooting sharks to death. It’s like visiting another country where a few fellow South African tourists have been killed and then seeking revenge by shooting innocent people. It’s called murder. I’ve been diving with sharks for over 15 years now and it’s one of my greatest joys. I appreciate that when diving with sharks that there is a very small risk of being bitten, but much smaller than my concern for my own safety of being hijacked in my car late a night. I do not propose anyone reading my blog should go out and try the same, strip naked and jump into a ocean of sharks, and I have also never denied that sharks occasionally bite people or kill people, but putting shark bites into perspective (on average less than 10 people are killed by sharks worldwide p/a) , and changing the negative perception that people have of sharks is what I aim to achieve through my efforts. This campaign’s video production on Youtube reveals the very thing we promote: sharks are not monster man-eaters, if they were I would not be here anymore – not whole anyway. We are living in critical environmental times where our oceans are increasingly under pressure from challenges and threats such as overfishing, habitat, and biodiversity loss, climate change and ocean acidification. This is cause of great concern for every individual on Earth because our oceans are our life support system, the Blue Heart of our planet: they provide most of the oxygen we breathe, most of the fresh water that we drink, protein and medicine to billions of people, amongst other reasons we need healthy oceans. Our sharks play a vital role in maintaining the delicate balance of the marine ecosystems, and our oceans denuded of them will have severe repercussions on all of humanity. In simple terms, when our sharks die our oceans die, and when our oceans die, we die. We therefore need our sharks alive, every single one of them. Please therefore support our BAN DRUMLINES & SHARK NETS Petition here and please support Australia #NoWASharkCull here: www.nosharkcull.org. 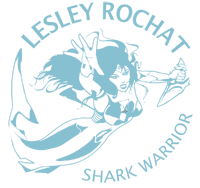 Also visit Shark Warrior website and support shark conservation. Together we can stop the slaughter! A very big thanks to the team who gave of their time and expertise to make the campaign a reality: Walter Bernardis, logistics and creative director from African Watersports, Raffaella Schlegel, photographer and camera, Lauren Chiccaro, my safety diver and camera, it was great working with you all! Thanks too to Dietmar Posch and Sandy Bernardis for extra camera, and Grant Atkinson, David Commerford and Terry Corr back home for support. And to Roland Albertson for the awesome track on the BEHIND THE SCENES cut, You better believe it! You all rock! For the sharks!